Promoting a song to radio stations is an expensive proposition. Needless to say, independent artists or bands have to manage their resources very carefully. The following, is how Jay Elle (https://www.jayelle2222.com), the rebel butterfly, an independent singer, songwriter, and guitar player from New York City, uses two low cost Internet services to decide which of his new songs he will promote to radio stations. New York, NY, October 12, 2018 — Promoting a song to radio stations is an expensive proposition. Needless to say, independent artists or bands have to manage their resources very carefully. Without the financial backing and the connections of a major label, or enough money to finance radio promotion efforts independently, independent artists don’t have the luxury to promote two, three, four or more songs to radio stations. They have to narrow down their choices, most often, to just one song. Deciding which of a set of new songs should be the single to promote to radio stations is a challenge. The following is how Jay Elle (https://www.jayelle2222.com), the rebel butterfly, an independent singer, songwriter, and guitar player from New York City, uses two low cost Internet services to decide which of his new songs he will promote to radio stations. Jay Elle just used these two services to select his new single Never Dreamed (I Could Be The One). The process is simple. It boils down to getting direct feedback from Internet radios music listeners, DJs and programmers of Internet radio stations. Services such as Radio Airplay will give their listeners the opportunity to react to a song. Listeners can choose to become fans of the artist and even submit comments to the artist after they hear a song. For the artist, the cost of using Radio Airplay is relatively low. Jay Elle puts money into his Radio Airplay account on a monthly basis to accumulate credits. When it is time to present songs to the Radio Airplay listeners, Jay Elle divides his accumulated credits equally between his new songs. The songs are played to the Radio Airplay audiences and over a few weeks Radio Airplay’s reporting shows Jay Elle which of his new songs gathered the most fans and positive comments. In addition, through Radio Airplay’s system, Jay Elle chooses which artists he believes are similar to him, his style, his voice and his overall sound. Radio Airplay uses the term “targeting” to describe this process. Jay Elle’s songs are played amongst songs by the artists Jay Elle has chosen to target. Radio Airplay’s reporting reveals whether Jay Elle is indeed associating himself with similar artists but also suggests other artists based on the audience’s reaction and feedback after listening to Jay Elle’s songs. For example, Jay Elle “targeted” Justin Bieber. The reporting by Radio Airplay showed that even though there was a positive connection with Justin Bieber’s fans (over 60%), Bruno Mars’ fans were more responsive to Jay Elle’s songs (over 80%). By looking at the percentage of Radio Airplay listeners who opted to become fans of Jay Elle after hearing his songs, Jay Elle can see which of his songs is generating the best response, that is the greater number of fans. After presenting his new songs to the Radio Airplay audiences, Jay Elle takes the song that generated the greatest number of fans and submits it to Promobuzz. Promobuzz makes the song available to Internet stations. Promobuzz is also within Jay Elle’s budget. If the song is added to radio playlists by DJs and programmers through Promobuzz, Jay Elle feels confident that he can move this song to the next promotional level and engage in a more involved promotion campaign to radio stations. Jay Elle chose his latest single Never Dreamed (I Could Be The One) using the process just described. In the case of Never Dreamed (I Could Be The One), Jay Elle took one extra step. Jay Elle approached Brent Kolatalo (Bruno Mars, Ariana Grande, One Republic), and asked how Brent felt about the song and if he heard a way to improve on the original mix. 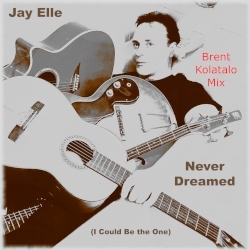 The results from Radio Airplay and Promobuzz and the powerful mix by Brent Kolatalo raised Jay Elle's confidence in the song as a single and its potential to be added to radio stations playlists. So, Jay Elle then contacted Laura Patterson, the managing director of Star 1 Records, Star 1 Group. Laura and her team had released and promoted Jay Elle’s debut EP “Rising Tide.” Michael Stover successfully lined up interviews and Sherry Lynn garnered radio airplay to support the release. Laura was all in after hearing the new single Never Dreamed (I Could Be The One). Sherry Lynn is now presenting Never Dreamed (I Could Be The One) to radio stations. Everyone feels great about the song. Jay Elle (https://www.jayelle2222.com), the rebel butterfly, is a New York City based singer, songwriter and guitar player. Jay Elle's heart and emotions are his driving forces. His curiosity and appetite for life makes him an avid listener of all music genres. Influenced by classical music as much as pop, rock, rap, country and R&B, Jay Elle believes that songs should carry positive energy and messages that bring people together. Jay Elle takes you on a journey while openly sharing his experiences. Become a keeper and sharer of wisdom. Follow Jay Elle, the rebel butterfly, from song to song. Watch for Jay Elle's new EP coming out early 2019. Never Dreamed (I Could Be The One) is distributed by Amuse and is available in all digital stores (including Amazon and iTunes) and through streaming services (Spotify).